let sound: String = Bundle.main.path(forResource: fileName, ofType: "mp3")! let exportPath: String = FileManager.default.urls(for: .documentDirectory, in: .userDomainMask).path+"/"+outputFile+".m4a"
let export: AVAssetExportSession = AVAssetExportSession(asset: composition, presetName: AVAssetExportPresetAppleM4A)! No error checking in the “try” lines, but that is left up to you. The function (createSound) takes an Array of MP3 files (found in the application bundle) and creates a single named M4A file from the concatenated result. Filenames provided to the function do not include the suffix (.mp3, etc.). There isn’t going to be an updated book this year, but I’ve just posted updated projects and am working on updates to the text that I will hopefully be able to release. I’ll be posting errata as best I can, so watch the site/Twitter for updates. If you’re experiencing the error “An App ID with Identifier ‘com.teachyourselfios.Welcome’ is not available” when trying to install the Welcome app on your device, the fix should be simple (and wasn’t required until recently). Click the Welcome project group in Xcode. Make sure that the Welcome target is selected. Change “com.teachyourselfios.Welcome” to another string of your choosing. The problem is that Apple knows that I (a registered developer) have used that string already to compile the application. When you attempt to use it, it sees it as a conflict – even though the app in question has never been submitted to Apple for App Store processing. Sigh. Hour 6, page 215 – there is text remaining from the Objective-C edition that mentions a “interface file.” Swift classes are contained within a single file. The text should state that actions are defined after global variable properties in the .swift file. 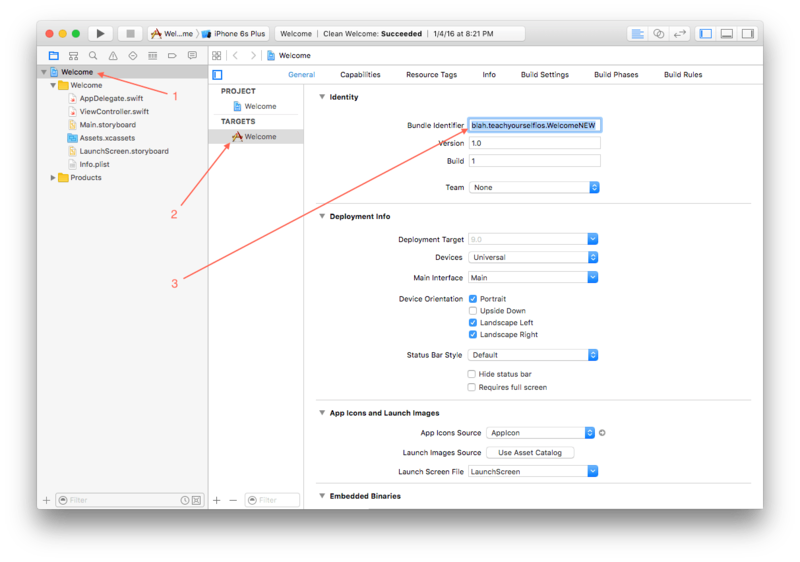 Hour 4, page 147, in the section “Using Quick Help” – Apple has changed the NSDate class so that it properly returns an NSDate object, instead of AnyObject. Unfortunately, my example was not updated to reflect this. In Hour 3, page 122, answer 10, the correct answer is spelled out, but the wrong letter is provided. It should be ‘A’, not ‘B’. iOS 8 Hour 3: String Replacement OOPS! var myFullName: String = "John Ray"
The horizontal and vertical guides are now accessed by choosing Editor, Canvas, Add Guide. In the last paragraph on page 86 (Hour 3), I reference “myInstanceMethod” being defined on line 14. This is incorrect – it is actually defined on line 17.